This simple dish packs in a ton of flavor and warmth. It&apos;s an easy crowd-pleaser, too! Paleo: Use zucchini noodles and Paleo-friendly pesto. 1. Cut raw chicken into cubes; set aside. 2. Bring a large pot of water to boil. 3. While waiting for the water to boil, halve the tomatoes and set aside. 4. Once water is boiled, add pasta. Cook for 10-12 minutes or according to package directions. 5. While pasta is cooking, heat olive oil in a frying pan. 6. Once oil is hot, add the chicken, flipping until chicken is sufficiently cooked through. 8. In the pot or a serving bowl, transfer pasta, chicken, and halved tomatoes. 9. 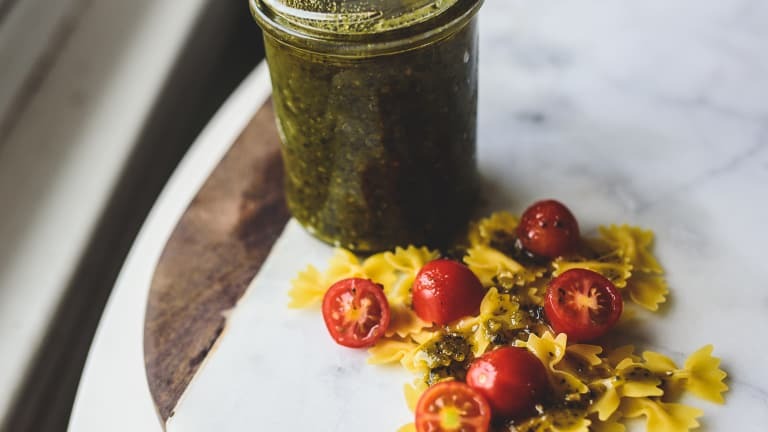 Toss ingredients with pesto. Typically the entire jar is needed, but add as you desire for taste. 10. Serve with parmesan and Italian bread, if desired.